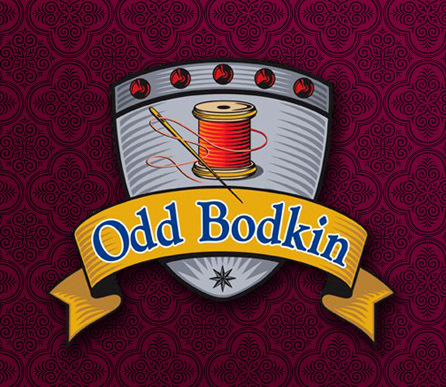 Dev's Lacing Technique : Odd Bodkin Renaissance Shop, Inspired by History, Designed for You! Being laced improperly is a huge pet peeve for me. It makes me so angry when I feel like my bodice is jacked up. Here's a technique for avoiding the hassle and pain of a poorly laced bodice! This talks about a back laced bodice, but also works when lacing yourself, or being laced into a front laced bodice. This is an especially useful technique for lacing up bootylicious girls with short waists but it works for darn near everyone! The first thing to do is to completely loosen (not unlace) the side laces and then tie them. Have someone help you with the lacing on back laced bodices. I've had customers try to lace themselves on the side and I can't imagine that was very comfortable. The laces start by placing the tips into the grommet holes from outside to in. This makes a loop on the outside of the fabric. Most sneakers are laced with the loop on the outside, to give you a visual. This helps keep the bodice bottom from getting scrunched. Your assistant will very loosely start to lace, not even THINKING about tightening them until they are past your waist, or about 5 -6 grommets up. The higher they can get up your back without tightening, the better. They should never pull UP on the laces. This will make it very difficult to get the bodice to sit properly. Only ever pull down or straight out. Your job will be to stand in front of a mirror and adjust your assets as they go. There should be no hurry in the lacing process. It will probably take about 15 minutes to complete. Once the laces are loosely in the back of the bodice up to the waist or higher, the assistant can start to tighten. Do this by pulling on each lace individually, not by looping a finger into BOTH laces. Pull the laces by looping a finger under them, then pulling them downwards and gripping them with forefinger and thumb. There is no need to tighten too much, just enough to get enough lacing to go up a few more grommets. They can even tie off the laces at the top, so that their work doesn't come undone while tightening. They should never pull directly on the most bottom laces. You can tighten those by pulling on the laces 3-4 grommets up. As they work their way up the back, they will continue tightening in small increments until they reach the top. I often repeat the tightening process 3-4 or even more times. 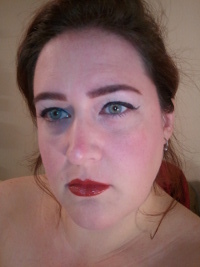 You should be making sure you adjust and fluff your cleavage and making sure the bodice does not ride up in the front or the back. Once the laces are fully closed in the back, the assistant can move to each side. They should once again, start about 3-4 grommets up and tighten on each side. You may want the laces to be "pyramid-style". Basically, more open on the bottom and tighter at the top. I wear my laces like this usually and nobody has ever noticed.